There were two stories in the news today about high profile public sculptures in the UK. It was announced that Mark Wallinger's proposal to build a giant horse in Kent has been selected for the "Angel of the South" project and will be built pending Councillors' approval. My views on his proposal are aired in this earlier post. A week before its unveiling the tip of one of its spikes fell to the ground. 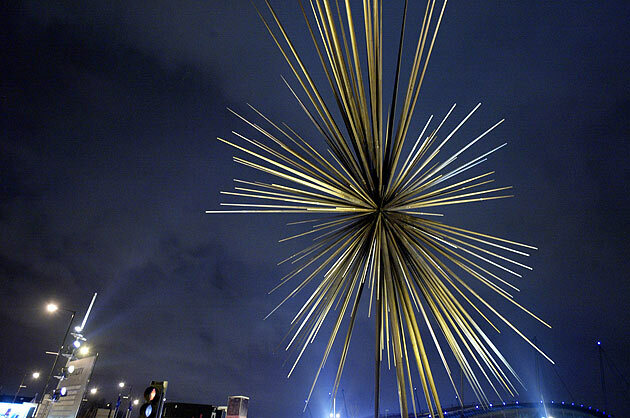 In May 2006, nine more spikes were removed for safety tests amid fears that the sculpture, designed by Thomas Heatherwick, might pose a risk to passersby. In November last year, the Thomas Heatherwick Studio agreed to pay Manchester city council £1.7m in an out-of-court settlement over the safety problems. The council's executive committee decided today that the sculpture should be dismantled, citing "technical problems".